Home Giveaways	Stellaluna A Puppet Show and 4 tickets to GIVEAWAY! Janell Cannon’s Stellaluna has become one of the many loved books by parents and children and is now a puppet show that you can’t miss. 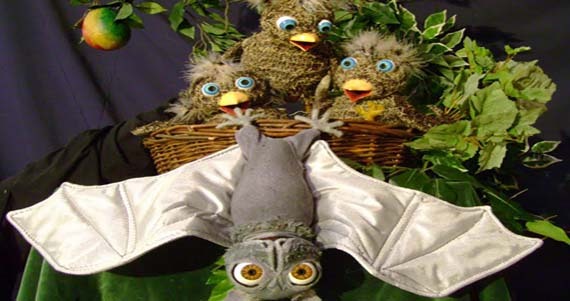 Come and join the many families who will be there to experience this live show as Stellaluna, a fruit bat, is separated from her mother before she is old enough to fly and finds out that not all winged creatures eat fruit. But eating food that crawls is just one of the many amazing things this little fruit bat must learn to do. Have you read Stellaluna to your little ones lately? Well, here’s a great chance to see this book in action. For one night only on December 4th at 7:30p.m., the Théâtre Raymond Kabbaz proudly presents, Stellaluna a puppet show for the entire family. Our wonderful friends at the Théâtre Raymond Kabbaz in West Los Angeles were very generous to give us 4 tickets to give out to one lucky family for this one night show. If you would like to purchase tickets to this show, check out the Théâtre Raymond Kabbaz website for further details. To enter this giveaway, please follow these giveaway guidelines. MAIN RULE (1 entry) – visit http://www.theatreraymondkabbaz.com/ and leave us a comment about any of their upcoming shows or any technical facts about their theatre (i.e. “they have 215 seats in their theatre”). *Leave a separate comment with your twitter name after your retweet. This giveaway will run through 12pm PST on December 3, 2009. Winner will be announced at 3pm PST on December 3, 2009. Winner will be chosen using Random.org from all valid entries and notified via email. Winner will have 6 hours to contact us before another winner is chosen. Giveaway is ONLY open to those who will be in Los Angeles for the show. The theater is equipped with a lighting system of more than 150 projectors installed on five ramps and entirely programmable. A mobile control console is anchored behind the scene. Sound equipment is composed of a 40 track Midas mixing table, two digital recorders, two cassette players, one effect module, two graphic equalizers, an amplification of about 4000 watts distributed on four frontal loud speakers, two boomers in the back of the room and six stage returns.